Get ready for a surge in the popularity of the Mazda MX-5, which was crowned the World Car of the Year at a ceremony in New York last week. After several near misses, Mazda finally picked up a gong at the World Car Awards, beating the big German manufacturers to scoop a historic double. The MX-5 not only triumphed in the Car of the Year category, it also picked up the prize for Best Car Design – the first car ever to pick up both of these top awards in one year. Some 70 jurors, who are each invited to test drive the shortlisted vehicles, decide the allocation of the awards, which have been in operation since 2004. In the overall category, the Mazda MX-5 edged out the Mercedes GLC SUV and Audi A4 to claim the prize. 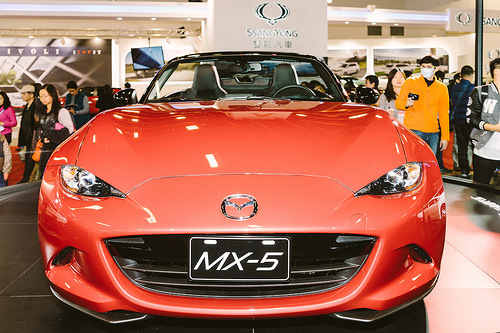 The fourth generation MX-5 ended up beating one of its own family in the design category, with the CX-3 also shortlisted, along with the Jaguar XE. Other awards of note this year include the World Performance Car of the Year, which was won by the Audi R8 Coupé, while the Toyota Marai took home World Green Car of the Year, following in the footsteps of 2015 winner, the BMW i8. The German giant also got in on the act in 2016, picking up the gong for World Luxury Car of the Year with the 7 Series.